So even though I've owned my car for over 10 years now, there is still a first time for everything - so this was the first time I had ALL fluids in the car changed out at once. 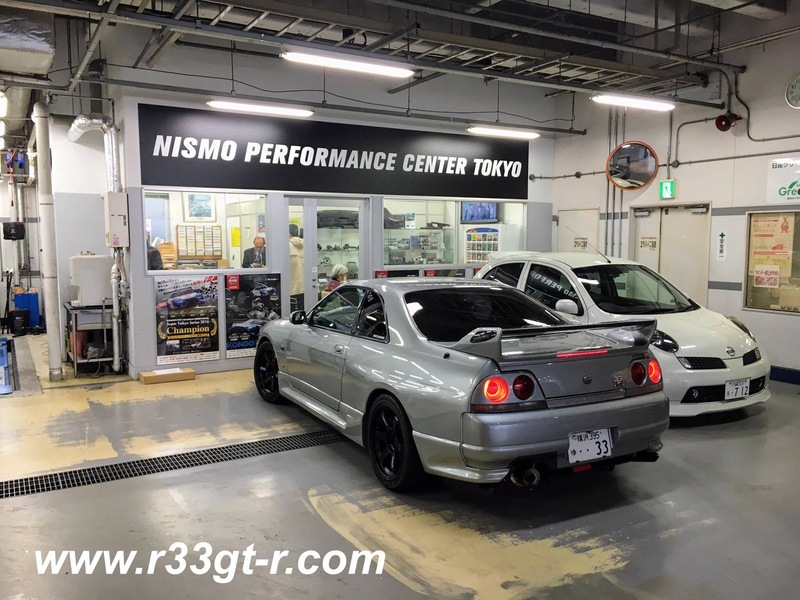 So, I called up the guys at Nissan Prince (specifically Nismo Performance Center Tokyo, at the Nissan Prince dealership in Sakura-shinmachi) for a Sunday appointment to "replace all fluids." Oh, and since my BNR34 otaku friend Alessandro happened to be free that day, I invited him along as he had been asking me for a ride in a tuned GT-R. Oh, and he loves going to NPCT as well, being there almost every weekend hunting down parts for his GT-R before they disappear from Nissan stock. Maybe one day he will talk about his experience in my car. combined with the dust on the car and the exhaust soot, left its mark on the car! 1) Oil change - I had found several liters of (unopened) Motul 300V (5W-40) in my garage, which they had no problem using. I usually ask for and use 15W-50, but as it's still cold in Tokyo... and bringing my own oil, which I bought at discount, saves me money! Oh, and for filters, given a choice of Nissan or NISMO, with a price difference of only 300 yen or so, I went with NISMO. Yes, slight brand whore...oh and yes shame on me last time I changed the oil was when I tried out that NISMO motor oil, back in June 2015! (but probably about only 1000kms back). 2) Brake oil change. Remember my drive in Hakone with Dino, Russ and Miguel? At the time it seemed like either the pads were gone or the fluid was boiling too easily. A quick confirmed plenty of pad life left, so new brake fluid was needed. I brought some Endless RF-650 (DOT 5.1) for them to replace the old RF-650. Last time I changed it was...probably 3-4 years ago? Yikes. 3) LSD oil change. I recently heard the OS Giken Super Lock LSD, which is normally very quiet, start making some noise so figured it was time for some new fluid, having never changed the oil since I had it installed more than 6 years ago. I had stock of the OS Giken 80W-250 oil, for exclusive use in this LSD. 4) Power Steering fluid. Although I only asked for Nissan OEM, they went ahead (after checking with me) and used NUTEC ZZ51-kai. Which turns out to be AT fluid. 5) Engine Coolant - I told them Nissan OEM was fine. 6) Air Cleaner - I decided to get a new one as the last time I changed mine out was about 20,000kms ago. NISMO of course. 7) Front LSD - this was done when the Getrag was installed last year so I demurred. 8) Clutch oil - I asked them to use whatever RF650 was left over after the brakes were done. Finally, I also asked them to check to see if the leak they had previously found in the Getrag, was back. Hmm. That doesn't quite look right. Finally this past Thursday, I left work early and took the train to the dealership. First time I had dropped by this late, actually. Of course I quickly found my car. Yamazaki-san had made sure that, in addition to the coolant, the ATTESA fluid had also been changed out. I have never had this changed out since owning the car, and he told me that the schedule to replace is 60,000 kms or so. And while I was paying, I asked a bunch of questions about some upcoming NISMO parts. Stay tuned! The view out the office window. Can you spot the blue R33 lurking in the corner? There was one last item that I had noticed when I had attempted to pick up the car on Sunday - the gas pedal was a bit "loose" - turns out that the throttle cable had stretched a bit so that was adjusted as well. Amazing how that detail can make the car feel so much more solid! Yamazaki-san moving my car out of the pit for me to drive home. 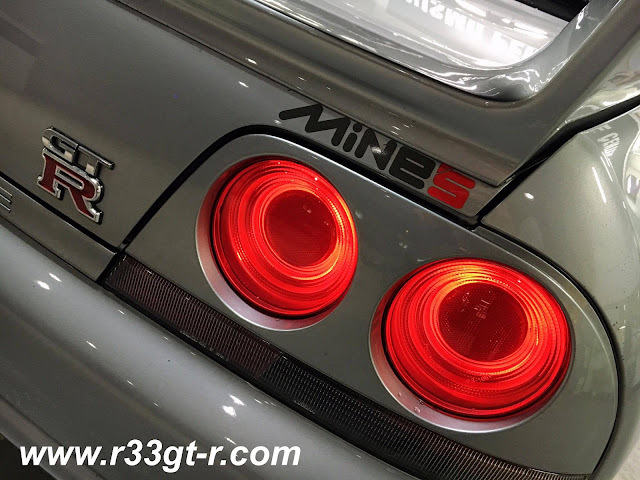 With more power, the GT-R feels lighter and more nimble (but strangely, not smaller - I think primarily due to the seating position), but this is to be expected. Surprisingly, I prefer the brake feel of the IS-F (also Brembos) so perhaps it's time to look into new pads on the GT-R? In any case, lots to do to keep improving the car... I promise my next post on Speedhunters will demonstrate that! The fact that the original KR4 Silver paint still looks this good and shiny in your photos despite being 20 years old now. It shows how much effort you put in to take care of your car, Aki. Good quality paint job from Nissan back then. Thanks brother! Not sure about the paint quality to be honest, but keeping it clean means also protecting it with the right chemicals! I know this isn't necessarily related to the subject but I noticed that you have asked regarding HKS VCAM and its application with a Haltech Platinum Pro ECU and you have also mentioned that your catalytic converter has a tendency to clog. For VCAM if you want the Platinum Pro plug-in ECU, Haltech does not support VVT. You would want the VALCON variant. If you want a single ECU, the Elite 2500 with Haltech's adapter harness will work for your use. Your ECU tune is likely far too rich as soot is indicative of excessively rich tuning. 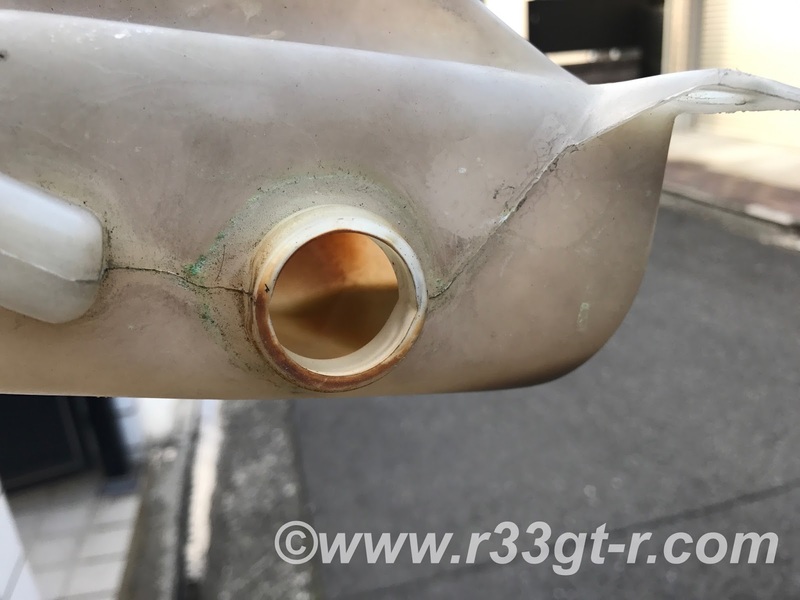 It is possible to retune the stock ECU for the BCNR33 and BNR34 but it is more effort than it is worth as the Hitachi H8 is a proprietary CISC architecture. Resolving this issue will very likely yield more performance and better fuel economy along with improved catalytic converter longevity. Anonymous - that's exactly right! I actually sold the Platinum Pro that I was planning to install last year, and am now looking at alternatives. And yep I agree the tune is old school, being too rich. As my budget allows, this year one thing I need to do is to get a new ECU, new injectors, etc. and, as you say, try to get more performance AND better fuel economy. Thanks for the recommendation on the Elite 2500, that is one I am looking at! Being in Japan I would rather get something that the local tuners are familiar with. F-con 4.0! The concern with the F-Con ECUs is that the DRM is extremely restrictive. There is literally no way for you to alter the map of your own ECU once set by the tuner. It's also worth noting that as far as features goes the F-Con seems to lack some of the more advanced features of the Haltech ECUs. It's possible that HKS just doesn't list these features but it's actually possible to even do things like a basic OBD2 retrofit for simple diagnostics and live readouts. Theoretically, it's even possible to do torque management with the Elite 2500T if the appropriate sensors are fitted. This allows for true launch control and transmission protection to cut torque if clutch slip is detected. Of course, there's no substitute for experience here. Hey dude. love your blog and your car! heaps of information! Is there a way to contact you via email? i dont want to post my email as it might get picked up by bots and ill receive spam till the end of time lol. 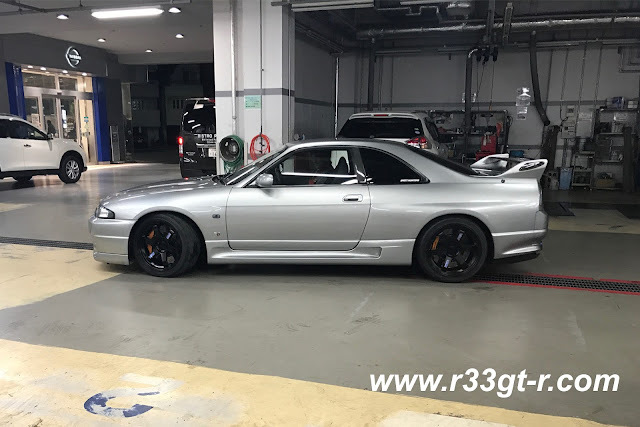 Im wondering if you can give me some high res versions of the 96 R33 options brochure? Maybe you could upload them to imgur or something? I was looking for oil for the Attesa actuator (the oil tank in the boot on driver side). The workshop manual says "Nissan Power Steering Fluid Special". People often refer to it with "Nissan Power Steering Fluid" without the Special but I think these are two different oils. Do you know what oil could be used as an alternative ? Do you guys there also use Motul dot5.1 on brakes and clutch or just use dot 3&4? Some say it’s ok since 3-5 are all compatible, dot 3 is the minimum requirement, with improvements on temp, etc. But some would just stick to what was written on the brake reservoir cap which is dot3.. which is kinda phased out already nowadays. Sorry guys, just saw these comments! Hopefully people got their questions answered? If not - I don't know about the alternative oil, sorry. I just let the guys at Nissan do their thing, but will ask next time I am there! Second, yes I use the highest performance brake oil on the car, which I think is not Motul but Endless? But 5.1 grade. I recall doing some research and at the time I bought Endless (I think) had the highest boiling point listed even amongst the 5.1 grades.